Since the last time I reported on ICE/ISEE-3, there have been several developments. 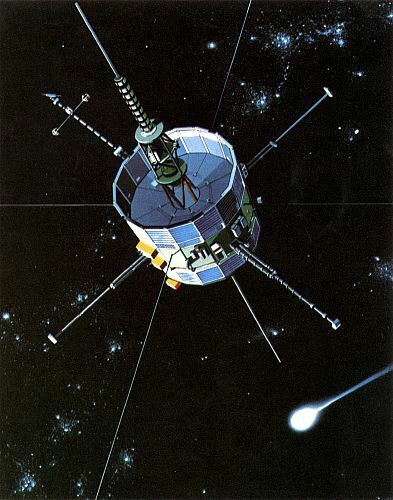 As a reminder, ISEE-3 was launched in 1978 to study Earth's magnetosphere and repurposed in 1983 to study two comets. Renamed the International Cometary Explorer (ICE), it has been in a heliocentric orbit since then, traveling just slightly faster than Earth. It's finally catching up to us from behind, and will return to Earth in August. It's still functioning, broadcasting a carrier signal that the Deep Space Network successfully detected in 2008. If we command the spacecraft to fire its engines at the appropriate moment -- something that must happen within the next few months -- we can recapture it into a halo orbit at the Sun-Earth L1 Lagrangian point. The spacecraft could provide useful science data and also a valuable training platform for spacecraft operations and international cooperation. But the hardware necessary to transmit the properly modulated signal to command the spacecraft was scrapped more than a decade ago, and as of my last update, a Goddard Spaceflight Center team had determined it was too expensive to attempt to rebuild that hardware in time. I have rarely had a post generate more comments and email than that one. In particular, amateur radio operators around the world contacted me to ask if I had information on the spacecraft's position. Leonard Garcia suggested that they use the NASA Satellite Situation Center Website, in particular its Orbit Viewer, to get location information. A short while later, the spacecraft was also added into JPL's HORIZONS solar system data and ephemeris computation service, making it easy for anyone to determine the spacecraft's trajectory. The first to pick up the signal were the AMSAT-DL team, a group of amateurs who use a 20-meter antenna located in Germany to receive signals from deep-space probes. 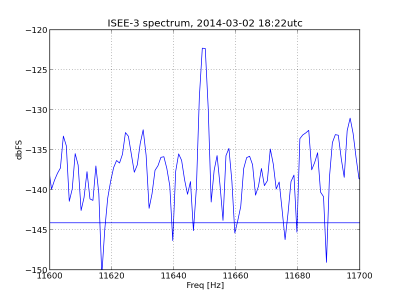 They successfully detected ICE/ISEE-3's carrier signal on March 1 and 2. We have also learned that the spacecraft's radio is about a thousand times less sensitive than the more modern systems we work with today. Because the trajectory correction maneuver to put ICE/ISEE-3 into the Earth-Sun L1 orbit has to happen well before the spacecraft's closest approach to Earth ­ and when it's still very far away, ­ we are not optimistic that we can get a strong enough signal to the spacecraft to execute that maneuver in time. Our licenses and our location in a highly populated area mean we have limits on our transmission-power levels, so we also don't have the very high-power transmitters that can be used elsewhere. We haven't given up and will continue to work with the Goddard team to figure out exactly what we can do and when we might be able to get commands sent to ICE/ISEE-3, as well as support discussions with other organizations that might have even larger, higher-powered antennas and transmitters and might be able to use our software-defined radio scheme with their systems. Finally, I need to correct an error in my earlier reporting on ICE/ISEE-3. 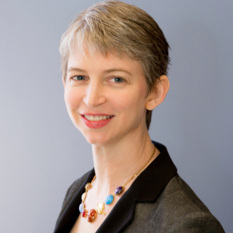 Back in 2008, Bob Farquhar told me a story that "the fellow who was supposed to have instructed ICE to turn off its radio transmitters during the last communications session maybe had not done so." But I now know that this story is false, as NASA's Jim Green explained to me this week. Jim said that since the original ISEE-3 was an Earth-orbiting mission with a radio system designed to receive transmissions from quite close by, it was a major challenge for it to receive commands from Earth as it drifted farther and farther away. He said that during the comet encounters they were using the world's biggest dish -- Arecibo -- to receive the faint signals from the spacecraft, and Arecibo had no transmission capability at the wavelengths at which ICE could hear them, so there was no thought of commanding it to do anything, much less to shut down. An earlier version of this article stated Arecibo had no transmission capability. In fact, Arecibo can transmit at 2380 MHz; but ICE receives at 2042 and 2091 MHz. Thanks to Michael Busch for the correction. Thanks for the update Emily. Are the folks at Goddard and APL working on this in their own time? Or has NASA allocated some funding? If it's the latter, then they should really go the whole hog, shouldn't they? Especially given that the stumbling block (transmit hardware of the requisite power) isn't something that the wider community can hack together, in the next few weeks. This story has also gotten me thinking. That space tug they want to use for the Asteroid Retrieval mission... how about deploying a smaller version (development iteration/ qualification model) to go snag ICE/ISEE-3 and bring it back? They could cost it under the Asteroid Plan :P Having said that, ICE/ISEE-3 is also a high-payoff (MISSE type of science payoff) target for a Robotic Refuelling Mission, which is also already under development). Does anyone know if ICE/ISEE-3's trajectory allows for such an idea to be entertained as feasible? i.e. The rate at which the range between the S/C and the Earth opens up after closest-approach, and the delta-V it'll take to throw a retrieval S/C after it, and the tune window afforded for development of such a retriever after factoring in those considerations..
Dammit. Typo. "and the TIME window afforded..."
http://makezine.com/projects/software-defined-radio-transceiver/ You'd still need a mixer to tune the DSN frequencies. I worked on ISEE-C at the beginning of my career in the Space Industry (@ Fairchild Space) as an Instrument Engineer and Test Conductor. I still have a number of pictures from the whole process. I was the last one to touch the spacecraft when I mated the umbilical prior to launch. It would be great to redirect the spacecraft to the L1 orbit. There are still a few of us around. It's the little spacecraft that could!